UPDATE: I have made an updated DO NOT BUY REVIEW post for newer phones like Galaxy S9, S9 Plus, Note 8, S8, and S8 Plus here. Now, this tempered glass is branded as many different tempered glass online Peyou, GPEL, iCarez, etc…etc… They are all basically made by the same company and you need to know that all of them have these flaws. Now, I am ONLY talking about curved tempered glass, regular flat tempered glass work well if installed correctly but curved tempered glass for S7 Edge/S6 Edge/S6 Edge+ are all the same and useless crapgadget made by the same company branded as different brands. First and foremost, once you put on one of these tempered glass on your S7 Edge or any other edge screen devices like S7 Edge, S6 Edge, or S6 Edge+, there is a grainy finish on the inside of these tempered glass which affects your AMOLED display. Now, this finish is supposed to protect against the actual tempered glass scratching the real Gorilla Glass of your phone but the big problem is that you end up with a crappy looking display. While most cameras don’t pick this up but in real life, you will see rainbow effect or grainy effect where everything looks grainy with little bit of RGB colors added. I tell, you this is the number one reason why you shouldn’t use tempered glass because it makes your AMOLED display into a $5 720P display. Why are you spending $20 on a tempered glass that downgrades your display? If you can absolutely live with this yucky display, then go ahead. Now if you don’t believe what I am saying, go read every comment about S7 Edge tempered glass written by actual customers, they will say there is either rainbow or grainy effect. Some people might not be bothered but I assure you, it’s like putting on crap rainbow glass in front of your $700-800 smartphone. Second, these tempered glass do NOT fit most cases from Spigen, VRS Design, etc…etc… They may work with S-View covers but others they do not fit and you won’t be able to use a case. If you can’t use a case with it, it pretty much beats the point of using tempered glass as a good case will protect your phone better than using a tempered glass which will only protect the front of the phone. Third, these tempered glass work fine for touchscreen in the middle but it will make typing on the edge glass such as typing “a” very unresponsive and you will have to use much more force than normal. In fact, typing is nearly impossible with these tempered glass as it makes the edge screen much less responsive. Now, the whole point of this video is to educate the consumers out there about how bad any of these tempered glass are for edge screen devices. 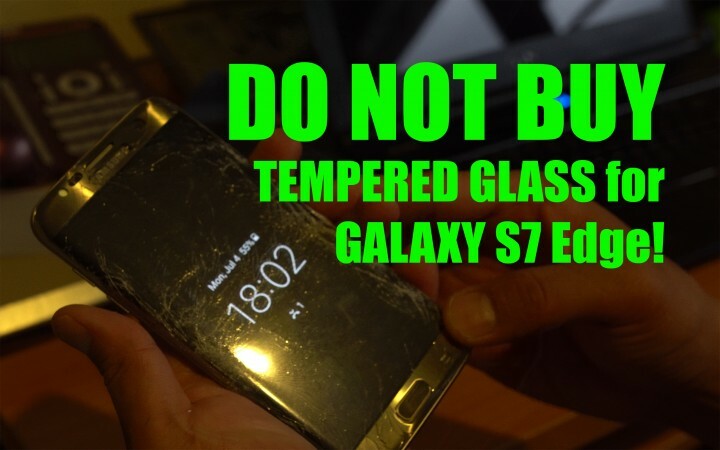 I know many YouTube videos on this topic say the same thing or they don’t tell you this and try to sell you crap glass you will absolutely hate. In fact, go to Amazon and do a search for tempered glass and most of them have 3 stars and less or have a bunch of fake reviews. I actually made an unboxing video for this product but because it’s so horrible, I decided to edit it out and tell you what you need to know. Don’t buy tempered glass for S7 Edge or any edge-screened smartphones, they are not worth it unless you are okay with it making your screen subpar with poor touchscreen. I just wasted $20 on this crapgadget, NO ONE should buy these seriously. If you want to protect your phone, my recommendation is to either buy a good case or buy insurance and enjoy your Samsung phone the way it was intended to. Thanks for sharing, interesting to see the flaws of the screen protector on a curved screen. Previous story Galaxy S7 Edge Iron Man Edition!